Deya Erickson—a 2014 Carifta Games U18 Girls finalist who also ran at the Youth Olympic Games last year—kept the National Record tear that began on Jan 23 alive for a ninth successive week. The record tear has been unprecedented in the BVI Athletics Association’s 44-year history and was extended during a busy weekend of competition for BVI athletes, with meets in Florida, North Carolina, Texas, Arizona and Puerto Rico. At the same competition, Ronique Todman was second in the 400m in 50.26 seconds, while Kyron McMaster recorded the worst 400m Intermediate Hurdles race of his career, when he cleared the barriers in 57.08 seconds. Aided by a +3.2 mps wind, K’Cei Moses won the 100m in 11.01 seconds. Shaquoy Stephens returned to racing with a sixth place finish in the 100m, clocking 10.94 seconds. Moses also had a wind aided (+2.8) in finishing third in his 200m heat, with a time of 22.48. Competing in the Willie Williams Classic in Tucson, Arizona at the University of Arizona, Central Arizona College Freshman Trevia Gumbs, bested twin sister Tynelle in the Discus Throw for the first time in their storied rivalry with a personal best 38.71m effort—vaulting to No. 2 on the All Time List—to Tynelle’s 36.59. Trevia finished fifth with Tynelle placing eight. Trevia had a heave of 13.96m (45’9¾) in the Shot Put to finish second, while Tynelle was third with a mark of 12.33m (40’5½. Tynelle Gumbs opened her 2015 Javelin Throw campaign with a heave of 36.92m to finish second. In his first Discus Throw of the outdoor season, Eldred Henry finished third with a throw of 56.27m (184’7”), before winning the Shot Put with a throw of 18.95m (62’2¼”). St. Augustine’s Khari Herbert opened his 2015 outdoor campaign with a third place finish in the 400m at the Wake Forest Open in North Carolina. He was timed in 47.78 seconds. 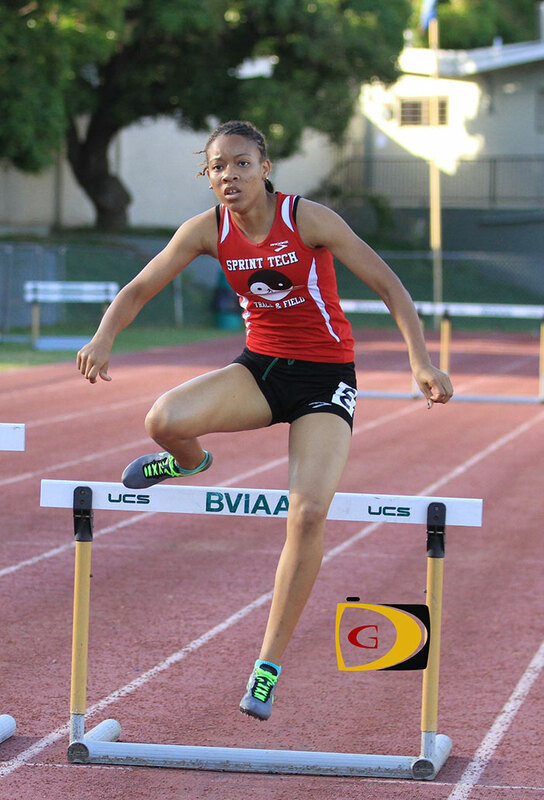 Cary High School Sr. Lakeisha’ “Mimi” Warner ran a personal best of 44.95 seconds in to win the 300m Hurdles at the Phoenix Invitational in North Carolina on Saturday, after running 45.24 seconds in a duel meet against Apex on Wednesday. She has the No. 1 mark in the event in North Carolina. At the 64th annual Texas Southern Relays, despite pouring rain, it was a personal best day for sprinter Taylor Hill. Hill registered a 200m personal best of 24.58 seconds, to place fourth in her first outdoor race of 2015. However, because of the weather and teams pulling out of the competition, officials cancelled the meet and she did not get to make her 100m debut. In her 1st 400m in 4 years, 200m specialist Karene King ran a personal best of 56.17 seconds, to place 4th in the Miami Hurricanes Invitational. Her time is No. 8 on the BVI’s All Time List. At the same meet, Tahesia Harrigan-Scott teamed with Veronica Campbell-Brown, Porcha Lucas and Lanece Clarke to win the 4x100m Relay in 43.66 seconds and the 4x400m Relay in 3:38.01.